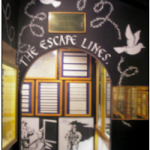 Eden Camp Museum in North Yorkshire hosts a unique ‘Escape Lines’ display in Hut 9, that was developed together with members of ELMS. Exhibits in the display, and the fascinating stories of escape and evasion, were provided by members of ELMS and their families. 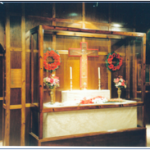 The Chapel at Eden Camp Museum contains plaques commemorating organisations that were operational alongside the escape lines during WW2. The chapel also houses a stone from the ruins of ‘La Maison d’Alphonse’ – a ‘safe-house’ on the Brittany coast that was betrayed and then destroyed by the Germans. It is inscribed with its BBC call sign ‘Bonjour tout le monde a la Maison d’Alphonse’.